When it comes time for you to groom your ferret, you may need to search wide and low for a specialty pet groomer. If you cannont find one or you want to save some money, learn how to do it yourself. Grooming includes bathing, drying, nail trimming, coat brushing, ear cleaning, and teeth brushing. Bathing ferrets is a somewhat controversial topic. People who are more sensitive to the natural musky scent of a ferret may be tempted or advised to bathe their ferret often, but this often backfires. The ferret's scent is partially due to the natural oils from the ferret's skin. A bath may temporarily reduce the musky scent, but because the bath strips the skin and fur of these oils, the bath actually stimulates an increase in the production of skin oils. The musky scent may actually become stronger for a couple of days after the bath. Keep the cage and litter clean and it will help keep your ferret smelling fresh. Bathing tends to dry out the skin and coat, at most bathe once a month. Unless your ferret has gotten into something that needs to be washed off, a bath every two to three months is probably plenty. You will need a gentle shampoo for your ferret. Your best bet is a shampoo made specifically for ferrets; there are several brands available. If you cannot find a ferret shampoo, use one formulated for kittens or even tearless baby shampoo. Some ferrets take quite naturally to water while others are very reluctant to take a bath. The first few experiences with bath time will set the tone of baths in the future, so if your ferret is afraid of water, go slow and be patient. If your ferret is fearful of the water, try to keep it as stress-free as possible. If you are stressed your ferret will pick up on this. Keep your tone upbeat, offer some favorite treats, and maybe get some fun waterproof toys. Making bath time like a special playtime. You can bathe your ferret in a bathtub or kitchen sink or any other convenient location. Fill the tub or sink with just enough water that the ferret will be mostly submerged but still able to touch the bottom. Support your ferret well. You may want to use a rubber mat or towel on the bottom to give your ferret firm footing. Use water that feels slightly warm to your touch, but not too hot. Lather up the body well, but make sure not to get shampoo in the eyes or ears (if you accidentally do, rinse well with fresh water). Rinse all of the shampoo out, since any left in the coat could be drying or irritating. Refill the tub with fresh water, maybe even a couple of times, to make sure the rinse is as complete as possible. Towel drying is usually sufficient and ferrets usually dry out pretty quickly, but it is important to make sure they do not become chilled when still damp. Unless their cage is freshly cleaned, that is not the best place to put them while still damp as a romp through a dirty cage or litter box will undo the work of the bath. Some owners put some clean towels in the tub and let their ferrets dry themselves off by burrowing in the towels. Some ferrets are okay with a blow dryer, but if you choose to try this keep the dryer on a low setting and keep it at least a foot from the ferret. If your ferret has fleas, consult your veterinarian before using a flea shampoo. Your vet will recommend the best program of treatment for fleas for your household, including a ferret-safe flea shampoo if indicated. Nail clippers meant for cats that look like small scissors with a little notch in the blade work well for ferrets. You can also use a small pair of human nail clippers. However, sometimes these pinch the nail before cutting and your ferret may find this uncomfortable. The trick to nail clipping is to cut the sharp tip off the nail without cutting into the quick. The quick is the part inside the nail where the blood vessel and nerve endings are located. Most ferrets have light or translucent nails, and the quick is visible as the pink part inside the nail. Make your cut a bit in front of the quick; if you get too close it may still be a bit painful. If your pet has dark nails, you will have to guess where to cut based on the shape of the nail. The tip of the nail is usually quite narrow and may almost appear hollow when viewed from the bottom. It is safest to just clip off about 1/4 inch of the nail tip. In case you cut into the quick, the nail will bleed and it will hurt your ferret. Make sure you have something on hand to stop the bleeding like Kwik-Stop powder or some other commercial styptic powder product. These products sometimes sting but are highly effective. Take a pinch of powder and press it onto the tip of the affected nail after wiping away the blood. For minor bleeding, simply apply pressure to the tip of the nail. No matter the method you use, make sure the bleeding has stopped before placing the animal back in its cage or leaving the animal unattended. If you have doubts about how to do it, it is wise to get a groomer, veterinarian, or another experienced owner to demonstrate nail clipping for you before you attempt it on your own. Do nail clipping frequently. If part of your routine, your ferret will get used it (and so will you). You will only need to trim a little bit of the nail each time. Make sure your ferret is restrained well and get help if necessary. If you hold it by the scruff, make sure its rear end is supported as well. Distract your ferret with a favorite treat if you need to. Styptic powder substitutes include cornstarch or flour. If you do not have that, you can press the nail into a bar of soap or beeswax. Regular brushing is a great way to keep the coat in good condition and is especially useful when ferrets are shedding to minimize the amount of hair ingested by ferrets, thus preventing hairballs. Many ferrets are not keen on staying still long enough for brushing, so get in the habit of doing a very quick brushing frequently. Use a soft, short-bristled brush meant for cats or kittens, or try one of the newer rubber grooming tools, which are great at quickly picking up loose hair from the coat like the Kong Zoom Groom. Even with regular brushing, it is a good idea to give a hairball preventative to your ferret regularly, especially when it is shedding. Preventatives are available in a malt-flavored gel in a tube, which ferrets often view as a treat. Ferrets do tend to have waxy ears, and keeping them clean will help prevent problems and infections. Normally, their ear wax is light brown or reddish in color. Regular cleaning will help you spot a change in the amount or texture of ear wax which could indicate an infection or ear mites. To clean the ears, get a mild ear cleaning solution from your vet or pet store. An ear cleaner safe for kittens should be okay for ferrets. Put a few drops in the ear, massage the ear for a bit, then let the ferret shake its head. This is great for dislodging wax, but it can be messy. Do this in an area that is easily cleaned such as the bathroom. A cotton-tipped swab moistened with the cleaner can be used to wipe out the external part of the ear. Never push a cotton swab into the ear canal. If your ferret is particularly squirmy, be extra cautious to avoid pushing wax down into the ear canal. Ear mites are quite common, and ear infections can occur as well. 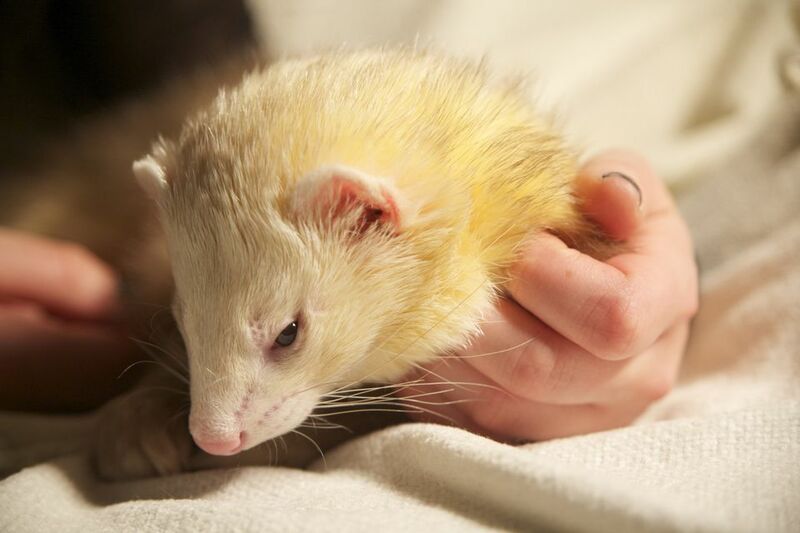 If your ferret has copious ear wax or discharge, dark brown or black wax, bad-smelling ears, or if your ferret is shaking his or her head, scratching at the ears, or tilting his or her head to the side, a trip to the vet is needed to rule out problems. Brushing teeth is a good preventative measure and also gives you a chance to spot any developing problems early. You should try to brush the teeth at least once a week. This is not the easiest part of the grooming routine, but getting in the habit can prevent dental problems down the road. Use a toothbrush meant for cats that looks like a set of short bristles on a rubber tube that fits over your finger or even just a piece of gauze wrapped around your finger. You can use a drop of your ferrets favorite liquid/gel vitamin supplement but never use human toothpaste. Then simply wipe the teeth with the brush or gauze. Aim for doing the outside surfaces of the teeth and gums at first, paying particular attention to the gum line. As with many other grooming procedures, your ferret may object strenuously at first. Be patient and slowly increasing the amount you do each session. Chances are your ferret will come to accept tooth brushing as a part of its routine.